We are specialist providers of deluge fire suppression systems. Our engineers have established an enviable reputation within the industry for the provision of deluge systems, reviewing our clients’ assets and offering deluge protection based on effective and efficient designs using internationally approved equipment, combined with world-class installation and service. Our scope includes the provision of deluge valve assemblies, deluge skids, Flameshield 300 deluge distribution piping systems, deluge nozzles and maintenance. Flameshield 300 is a cost-effective answer to corroded and blocked deluge distribution systems. Flameshield is installed quickly, does not corrode and requires minimum service and maintenance. 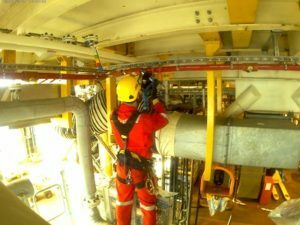 The build-up of corrosion inside metal pipe-work systems in harsh and challenging environments can pose a serious threat to system functionality, exposing personnel and plant to unacceptable risks. Blockages can result in expensive plant shutdowns until the problem is identified and cleared. Flameshield 300 is an alternative permanent piping system, internally constructed from nitrile rubber, re-inforced with steel braided layers and anti-static copper wire. It has a glass fibre internal membrane providing jet fire protection and an outer cover of red CR rubber which is abrasion, ozone, weather, heat and oil resistant. The Flex-Flo Deluge system comprises primarily of a Oglaend Mekano prism support system and DNV Approved Flameshield 300 Deluge hose from sizes 1½” through to 10” NB. This makes it suitable for use in new and replacement deluge and sprinkler systems. Flex-Flo is a modular system for the construction of flexible piping solutions. Specifically developed for firewater deluge in Asset Life Extension and decommissioning projects, Flex-Flo is equally suitable for new build or existing oil and gas platforms, chemical processing, marine vessel, drilling and well testing, heat radiation shielding, renewable energy or other industrial applications. Blaze developed the Flexolet nozzle, to allow the designers and installers the flexibility to quickly position nozzles into an already located deluge range supported on the Flex-Flo support system. We have an expert team of technicians providing service and maintenance of deluge systems. The technicians are supported by our team of engineers and designers, ensuring that the complete system is maintained at its peak condition.